With only about 400 left on the planet, each individual counts when it comes to North Atlantic right whales. But almost every year since 2002, at least one of these 60-foot-long, endangered species becomes entangled in commercial fishing gear, making swimming and feeding hard. Since 2009, following a Defenders’ lawsuit, trap fisheries such as lobster and crab have been required to use sinking rather than floating lines between their lobster and crab pots. Traditional floating lines can create large loops that pose a severe entanglement risk for the whales. When the lines sink and lie flat on the ocean floor, the entanglement risk is dramatically reduced. But entanglements and deaths are still occurring in these and other fisheries along the East Coast, and while the National Marine Fisheries Service (NMFS) works on further protections, it continues to allow fisheries to operate in a way it knows will kill whales. 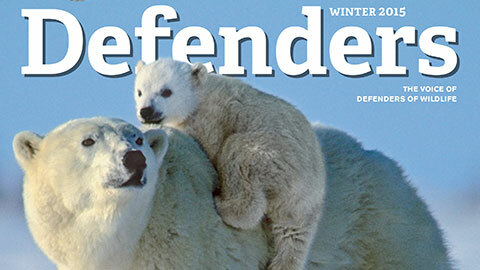 In October, Defenders went back to court to try to fix this problem and speed up new protections. Defenders’ past litigation over ship strikes—the other main cause of death for slow-moving right whales—brought about the first-ever speed limits for ships entering and exiting ports in right whale habitat along the eastern seaboard. Unlike other marine animals that chase their food down, right whales feed by sifting plankton—which float along at the whim of ocean currents—through their baleen. Such a leisurely pace also contributed to the population’s decline in the past: It made them easy to harpoon. It’s one of the reasons whalers deemed them the “right whale” to kill. Their unusually thick layer of blubber also kept them afloat longer than other whales after they died. Commercial whaling was finally banned in 1935—but by then, there were only a few dozen North Atlantic right whales left. Females also reproduce slowly, giving birth to one calf every four years, and they do not reach reproductive maturity until age nine or 10, making it harder for the species to rebound even without deadly obstacles in their waters.